The insatiable need for bandwidth and data from military radar and electronic warfare systems is continuing to put pressure on embedded signal processing designers to deliver innovation at the board and chip level. In this podcast, our guest, David Gamba, Aerospace and Defense Core Vertical Markets Senior Director at Xilinx discusses how FPGAs enable this innovation especially from an RF system-on-chip (SoC) perspective. In the podcast he details his company’s new RFSoC family — Xilinx Zynq UltraScale+ and how it benefits military signal processing applications. Gamba also provides his perspective on the upturn in the military electronics market thanks to the Department of Defense funding increases and how the military space market may be the best bet of all. This podcast is sponsored by Pentek, the leader in providing high-performance wideband and narrowband software defined radio board, recorder and system level solutions as a leading innovator RFSoC technologies. For more information about Pentek go to www.pentek.com/go/podcast. 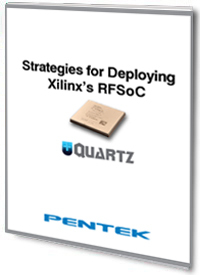 Xilinx’s new RFSoC brings a powerful and unique solution for addressing some of the most demanding requirements of high bandwidth and high channel count system. This paper provides a look at how RFSoC compares to the current trends in A/D and D/A converters and the strategies for getting the most performance out of this new family of FPGAs.